Things to do in San Marino. Don't miss this unique country on a mountain! Read one of those “Top 10 places to see before you die” articles lately? Or perhaps, “The top places to visit in 2018?” How about “Emerging travel destinations you must not miss!” Chances are, if you have, you won’t have seen any mention of San Marino. I have to admit that I am pretty happy about that. Keeping hordes of tourists away from almost secret locations means they stand a greater chance of never being overrun, to the point where it no longer bears any semblance of its former self. Despite my own selfish thoughts, it really is a wonderful place to visit. Have you heard of San Marino, Italy? Chances you have, but did you know it actually isn’t in Italy at all? Blink and you will miss San Marino. That’s if you are one of the fortunate people who actually know where it is. It’s a very common misconception that San Marino is part of Italy. Google searches will attest to this, with common searches of “San Marino Italy” rising to the fore. It’s “kind of” understandable, given that it is completely landlocked by Italy. However, the Republic of San Marino is one of the world’s oldest republics and one of the smallest countries and as such totally independent of Italy and any other country for that matter. It is also the only survivor from the Italian Renaissance days. Back in the 14th and 15th centuries, Italy was divided up into areas known as city-states. Regional areas surrounding an important city like Venice, Florence and Milan were ruled, usually by a strong and wealthy family. The Papal city-state, ruled by the Pope, was also a key part of the Italian system. With the later demise of the powerful city-states, curiously, San Marino maintained its independence. The Republic of San Marino is aesthetically beautiful, to match its interesting history. The capital of the republic, also called San Marino, was built as a fortress on top of Mount Titano, some 650 metres above sea level. It’s a place of stone fairytale castles and buildings. It’s the place where you can sit and sip a cold glass of wine on the edge of this mountain, as you take in the view below. On a very clear day, sweeping views across to the Adriatic Sea can be seen. As a mostly pedestrianised city, your trusty feet are the best option for exploring. Take your time, stopping along the way to take in everything this city has to offer. It’s impossible to get lost! Note that many of the cobblestone streets are quite steep, and wearing good walking shoes are definitely preferable. I wore heels out to dinner one night and had to almost tippy-toe on the stones. Luckily, I didn’t have to walk too far! Despite relatively low tourist numbers, there is still a juxtaposition between this ancient city and its attempt to eke as much money as they can from those who visit. Whilst the streets lined with shops add to the overall ambience and beauty, I would much prefer to see the majority of them filled with the unique local crafts that can be found in some of the shops. Once a tax haven and duty-free shopping city, the remnants of this over-commercialisation can still be seen in the bountiful handbag shops and other touristy items. I didn’t allow this to cloud my view of the city though, as it’s easy to just ignore the shopping aspect and focus on the real beauty. I didn’t come here to shop anyway, and I’m not tempted by shiny baubles and souvenir offerings. The Republic of San Marino and the city of San Marino is all about the fortress that sits aloft its mighty mountain. As you approach it from the ground, it elicits that first gasp. It sneaks up on you ever so quietly that for a moment, you wonder if it’s someone else making that noise. I look sideways at my husband and see his eyes wide with an appreciation of what we are about to see. The fortress, built in the 1200s, is comprised of three towers, all of which have been restored in some way over the years. Two of them were actually used as prisons up until the 1960s. The second tower sits on the highest part of Mt Titano, 756 metres above sea level. The third sits on its own, isolated from the others. Towers 1 and 2 can be accessed by the public. Tip: Despite the website stating that the towers are open all day, they were closed when we visited, probably due to a midday siesta. Before climbing up the hill, find out whether they are actually open! The Public Palace is the main location of all things official here in San Marino, including parliament. Located right on the town walls, it also contains guard towers, part of the city’s military defence in times gone by. It is particularly spectacular at night time. The Public Palace sits on one side of Liberty Square. A fountain adorned with the Statue of Liberty sits in the centre of the square that overlooks the hills below. Take a break in one of the many bars and cafes that line the square and watch the people go by. This was the site of the former postal administration and also the town clock, although the internal workings of it were transferred to the Public Palace some time later. This Catholic church is the main church of San Marino and stands apart from other buildings here due to its Roman architecture, notably the Corinthian columns at the front. The coat of arms of the Republic of San Marino can be seen above the front door. Just over the side of one of the walls of the city, is a huge hole, created when the rock was excavated to reconstruct the Public Palace. This is now used as a training area for crossbowmen. As luck would have it, on the day we were here, we were given a great display of this sport. The steps nearby were packed with people, sitting in the hot summer sun, watching the men ready their crossbows and shoot arrows into targets at the other end. The speed at which they whizzed past my eyes as I was watching them from above told me I didn’t need to get too close! For a small city, there are plenty of opportunities to eat, stop for a refreshment or enjoy an aperitif as the sun goes down. Given the physical location of San Marino, it’s easy to understand that the Italian influence is significant, and this extends to their food. There’s plenty of pizza (good pizza) on offer, along with the usual Italian suspect of pasta. There are many locations that offer a great view down into the valley or towards the Adriatic Sea. Alternatively, there are cosy cafes and restaurants, hidden in stone buildings in the main streets. With sweeping views and a location on the way to the First Tower, this bar is one that I would normally be enticed by the view but fear the service. Unfortunately, bars in these areas have proven time and time again to be expensive (over the top really) and lacking in service. This was not the case here, with prompt service, excellent prices, and their own specially brewed beer as well. We just had a refreshing beer here but the pizza and pasta that we saw stream continuously from the kitchen looked very good. Located on one of the highest points of the city of San Marino, the Hotel Bellavista restaurant offers traditional Italian fare, overlooking the Cava dei Balestrieri. In warm weather, take a seat outside on the street, overlooking the training area for the crossbowmen. Hotel Cesare has a wonderful outdoor deck perfect for an early afternoon aperitif. Whilst in Italy this time I took a fancy to their Aperol spritzers, a simple blend of Aperol, soda and prosecco. Served in a huge wine glass over plenty of ice, it’s the perfect drink for a hot day. For casual dining, the osteria on the ground level of Restaurant Righi, overlooking the Liberty Square would be my pick. With food overseen by Michelin-star chef Luigi Sartini, this is traditional family fare, served with the freshest of ingredients and the greatest of care. For a significant step away from the common (but tasty) food of San Marino, look no further than Restaurant Righi, the fancy friend of its stablemate osteria. Located above the osteria is the pride and joy of Chef Luigi Sartini. With one Michelin star under his belt, this intimate restaurant serves up innovative food made with only the freshest of ingredients. With degustations as a principal offering, the chef will prepare food unlikely to be seen elsewhere and perfectly matched with an impressive wine list. If you are wanting to stay in the Old Town itself there are only a handful of hotels. We stayed at Hotel Cesare, a four-star hotel just inside the walls. Rooms are small but clean with a full-size shower. The TV is as old as the city walls I suspect, but given I wasn’t in the room much this wasn’t an issue. The key to this hotel is access to the Old Town. Wherever you stay, don’t forget to ask at your hotel for the free TuttoSanMarino card, for discounts off tours, entry fees, guides, parking and shopping. The easiest way to get here is from within Italy itself. Unlike much of Europe, train transportation to San Marino is not possible. The train line was bombed during World War Two and has never been fully rebuilt. Access to the city of San Marino is now via car or bus. Buses leave from the main Rimini train station (20km away) and cost €5 per person each way. The trip takes about 45 minutes. Budget airline Ryanair flies into Rimini airport as do other airline companies. We drove from Bologna, only a few hours away. As San Marino is a largely pedestrianised area, traffic controllers monitor the traffic. They are also very helpful if you need to ask them a question. If you are catching the bus back into Rimini, this area at St Francis’ Gate is where you need to go to. The bus exchange lies directly beneath here and can be accessed via walking the winding road or by a lift just down a hill. There are several parking areas on the outside of the city walls. 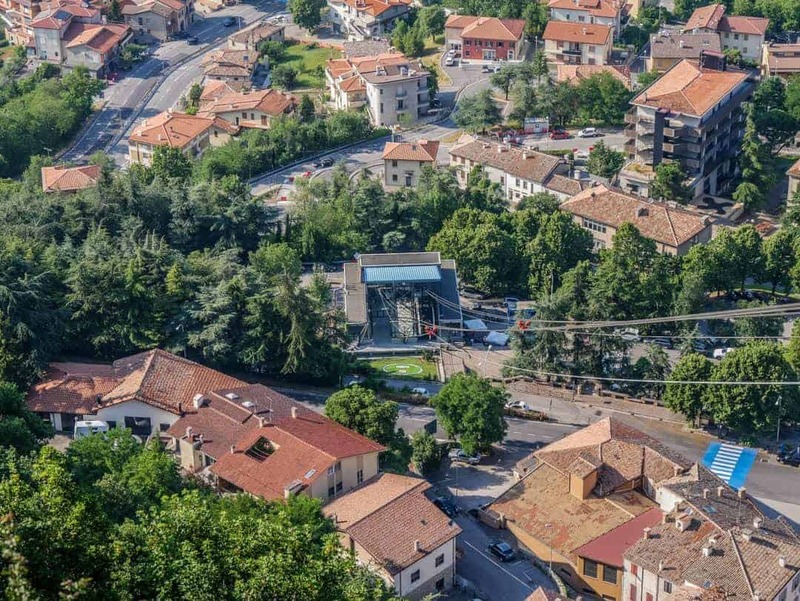 A funicular is also a fun addition to San Marino, providing access down to the town of Borgo Maggiore. There are plenty of things to do in San Marino, but there’s one thing in San Marino that you shouldn’t miss. Yes, it’s definitely touristy, but I felt I had to do it. There are no official borders into San Marino, so a passport is not required. 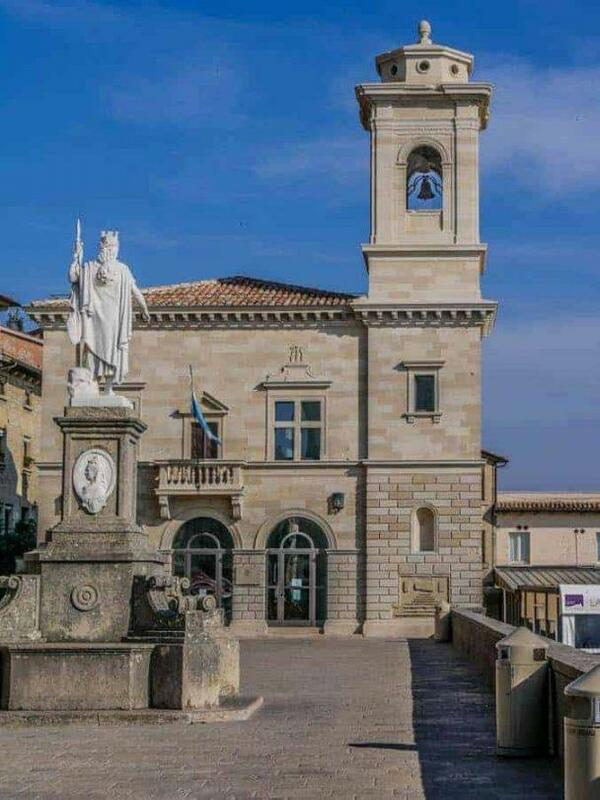 Trying to eke as much out of the visitor’s experience as possible, the San Marino tourism office provides a “tourist passport stamp” upon presentation of your passport at their office. It will cost €5 for the pleasure, despite it having no official certification whatsoever. However, I know I won’t come back here. As beautiful as it is, this is a place for a day trip, two days at most. There’s simply not enough to keep you entertained any longer. So, for the price of €5, I’ve got a beautiful stamp, stamped with care from the wonderful lady at the tourism office, and without the usual grunting you receive as you pass through the official passport channels. Worth it? Sure was. Special thanks to the team at Emilia Romagna Tourism and Blogville Europe for arranging our itinerary and journey into San Marino. Thanks also to the San Marino Tourism Board for having us as guests in their beautiful city. All editorial content is completely independent and all thoughts and opinions are our own. A former business executive, Kerri McConnel, left the corporate world to pursue a different lifestyle, establishing the successful travel website, Beer and Croissants. Kerri now travels regularly with her husband, Stirling, where eating great food, drinking quality beer and wine, and cooking international foods are integral to their adventures. She is also a firm believer that everyone can travel. To help provide inspiration, she creates comprehensive guides and articles that are written in a down to earth, authentic manner. It does look beautiful. It’s a great day trip idea, even if it’s just to cross the country off the list. Adorable! Of course, I had no idea that San Marino existed but would love to walk those cobblestone streets. Great tips about getting there and the discount card. The views are breath taking. I’m not much of a shopper either but it’s fun to people and window watch. I’ll admit, I hadn’t heard of San Marino until about a year ago, but have read much about it since. Hill-top towns are so picturesque. I love Aperol Spritz’s too, so sitting at the Hotel Cesare with one of those sounds simply marvellous. I love the idea of putting a passport stamp in your passport, despite not needing one. I love love love passport stamps, so it is such a lovely token of your visit. I’ve been to Italy twice and I told myself that I plan to visit the smaller cities. Great information to know that the train is a bust to San Marino. However, I can see the drive as the best adventurous and scenic rid. I certainly think you would love it all over again! I understand your concern about San Marino becoming popular… it will soon get infested with tourists. Looks such a cute little place with typical cobbled streets.Strange it doesn’t have rail connection. 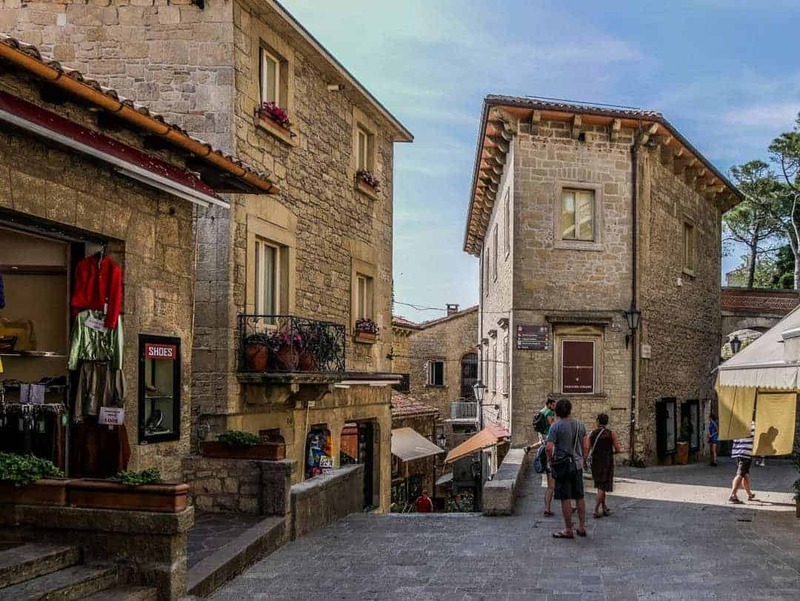 Okay, I’ve officially added San Marino to my list of places I must visit – and before reading this post I had no idea it even existed! Your photos are absolutely breathtaking and it looks like such a darling little city to spend a few days. The fortress looks so beautiful! Were you able to go when it was actually open? I love the way it looks with the greenery growing up the walls. I’m so glad I stumbled upon this post – thanks for writing! Thanks so much Val, it was such a delightful place to visit and one I had wanted to for so long. Oh wow, the architecture in San Marino looks stunning! That’s really neat that it was built as a fortress on Mount Titano—the views from the city look really amazing. The Public Palace looks absolutely gorgeous as well—I love how it looks like it is just perched up on the top of the hill! That’s too bad the train line was destroyed during the war, but I’m glad to hear there are busses running there still. I would want to get a passport stamp too—yeah, it’s touristy but it’s a fun souvenir! We really need to look into visiting San Marino now for sure! If ever I’d come and visit San Marino, I’d definitely see Basilica di San Marino, whenever I’m in a new place, I look for a Catholic church. Being raised as a Catholic, I love paying a visit to churches. The View from Bar Piadineria la Capanna is a must here I could say, I would definitely choose to dine in here provided by the stunning view. Pizza and pasta are always a perfect combination for me. And of course, the stamp is so nice! I’d like to get this one, too! Sure 5euro is worth it! Indeed! I tend to be fonder of charming little places than overly hyped tourist spots. That, and the Public Palace is lovely! I’d love to visit San Marino one day. Yep, you’re right – San Marino has not made it onto any lists I’ve seen going into 2018! Their loss! Though you’re correct – sometimes getting too much attention is almost like a curse because these spots often get overrun with tourism to the point where they lose their authentic charm. Which San Marino seems to ooze! I’ve actually learnt something new today, because I did think it was part of Italy – sorry San Marino!! So thanks for setting that straight. The foretress looks absolutely incredible – kind of reminds me of the Great Wall of China it looks so grand! And I would lovet o just wander and get lost among the cobbled streets. Thanks for the article! Thanks so much for this post. I had no idea San Marino was an independent country, and it looks beautiful. I’m planning an Italy trip right now, and I will definitely be adding this as a destination. Thanks for the great information, and the pictures are fantastic. Cheers T, we really loved it. I’ve never heard of San Marino before, but now I really want to go. It has so much history and the photos are beautiful! we’ve visited it in May with our baby:)) I chose it as our first family trip! loved it! But still haven’t blogged about it properly..
It’s such an incredible place isn’t it! I only searched about San Marino because this is for a project that I will be doing in Social Studies. My classmates even teased my picked country because it kinda sounds like a brand of sardines/corn beef. I never actually knew that San Marino is a country before my teacher assigned me to this country. When I searched the country and stumbled upon this blog, I thought, “Shame on those boys who made fun of this country because it is absolutely breathtaking! Thank you for posting such a really informative and helpful blog! Wish me luck on my project! I believe it will go well with this information and reaction I got from someone who actually traveled and stayed there. Don’t worry because I will put credits with your blog website captioned “the most helpful one of them all”. I rambled on so much and I think I should stop. Oh well, hope I have a good grade in Social Studies! Hi Sasha, thanks for stopping by and taking the time to tell me about your project. San Marino is indeed a beautiful place so I am quite sure you will do very well and show everyone how special it is.